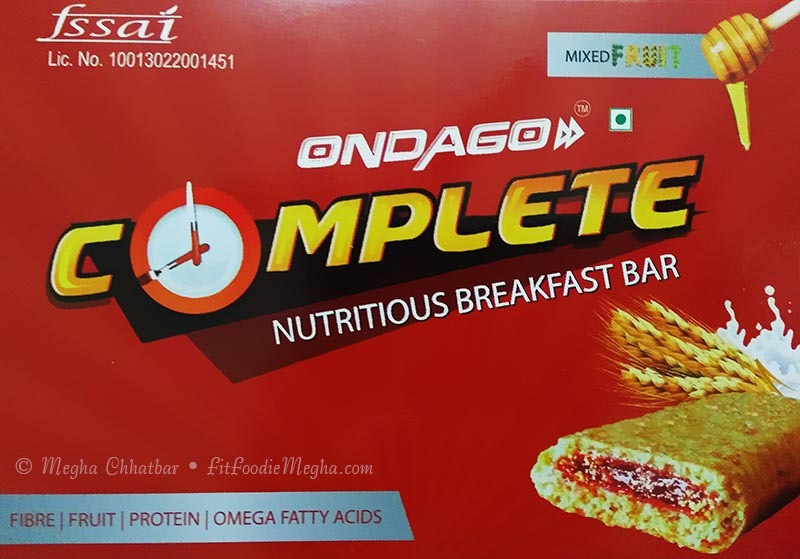 Fit Foodie Megha: Ondago Complete Breakfast Bar – breakfast on the go! — Reviewed! 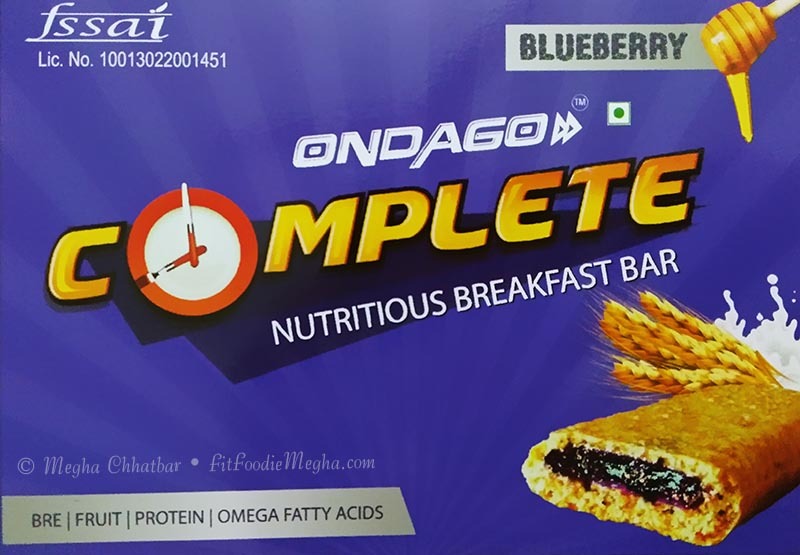 Ondago Complete Breakfast Bar – breakfast on the go! — Reviewed! With the name 'FitFoodieMegha' it is quite a task to manage the health between invites, events, write-ups, assignments. Late night workings mark a toll on the early rising and apparently on the diet, especially breakfast. I am always on the lookout for some grab and go meal which is not only nutritious but power packed with all the balancing ingredients to give me energy throughout the day. Now a days, market is surged up with the 'healthy snacks' like granola bars, protein bars etc. 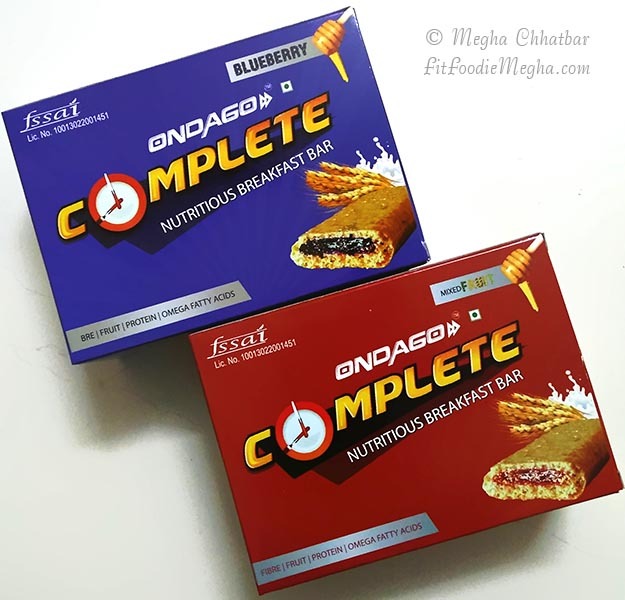 While browsing through, I found a supplement to an incomplete breakfast or you can say a quick healthy snack alternative — Ondago Complete breakfast bars. It is On-Da-Go; quite suffice to its name. I am sure to get my dose of healthy nutrition in the most convenient and delicious way with two wonderful flavours – Mixed fruits and Blueberry (Mixed fruits being my favourite). The bars have been formulated after a lot of research to come up with the perfect combination of taste, quality and nutrition. When I received the boxes, I decided the best way to try them can be breakfast, mid-afternoon snack or late night munch and trust me it worked for me anytime I ate. When I took the first bite, it was gooey, sweet with crunch of oats, healthy seeds and goodness of honey. One bar is filling for satiating instant hunger. And also it does not let me on sugar high as other bars do. It has almost all the nourishing ingredients which is necessary for a healthy breakfast. Grab a bar anytime and you are ready to go! The table below details the constituents of ONDAGO COMPLETE and their role in providing you a very nourishing breakfast. Energy: Glucose to help jump start the day. So, now its a routine to eat Ondago complete and let the energies flow in. It is easily available on Amazon, Healthkart, Paytm etc. One box contains 6 bars and each bar is Rs. 35.